Look for more articles from Jeff in his series this year! The “Snap-on” tools ’57 Nomad. I’m using this here because it’s cool looking, not because I have one to store my tools in….yet. Tools – You know you love them! Part of every gear head’s dream is to have a shop full of every tool imaginable; and I am no exception. I have a great garage space to work on my projects, and it does have some storage space. 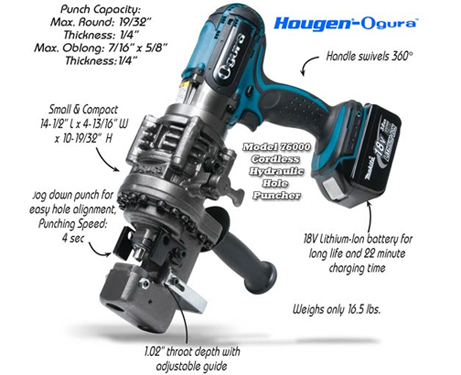 However, there is always another tool to buy; and, of course as I acquire more and more tools, my nice garage storage space seems less and less adequate. The cycle will probably never end – and I wouldn’t want it to! Anyone with a storage issue must eventually face the question: what – and how many – tools are really needed? 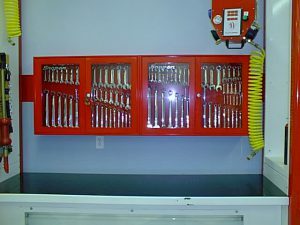 It may surprise you to find that it is not absolutely necessary to own a large selection of tools. The majority of projects can be done with some basic essentials. Not sure what I need this for, but it just looks cool! Welders, plasma cutters and sheet metal breaks are very nice to have on hand if you have the budget and space. However, the most important items to have in your tool box are a good set of sockets, wrenches, screw drivers, a jack and some jack stands. So, what makes for a “good” set of tools? The answer to that will usually differ from person to person. For instance, my two grandfathers each had a very different idea of how best to choose a tool; and both have their merits. Here I’ve given you examples of two different schools of thought from two men who used their tools on a daily basis. One told me to buy the best – PERIOD. He believed that, by buying the highest quality tool, you would never have to replace that tool if it was cared for properly and used appropriately (a screw driver should never be used as a chisel or pry bar, and an adjustable wrench is NOT a hammer, even in a pinch). The other said buy the best you can AFFORD. He believed in buying what was immediately available to him for a price he could pay. He was also careful with his tools and, while they may not have lasted forever, they held up well and didn’t need replacing for a long time. When the time came to replace one he, again, bought what was available and affordable. As time went on, he could afford better quality tools, and eventually he, too, owned the very best. 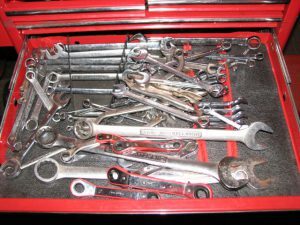 The question of whether you need a new set of SnapOn or Matco wrenches, or if a set of big box store wrenches will work for you can only be answered by . . . you! Ask yourself – how serious is this hobby of yours? Will you ever be attempting to make a living at this? Personally, I buy a lot of Craftsman tools. They are readily available, have a good warranty and rarely break (if I use them properly). For some of the more specialized tools, I look for higher quality if I expect to use it often. Other times I might buy a very inexpensive tool, because I may only do the job it is designed for once, and I figure even the cheapest tool should work once. Tool rental is also an option. Some auto supply houses will allow you to rent specialty tools, and only require a deposit and a small rental fee. This becomes a good option for tasks that you have the know-how to do yourself if you have access to the proper tools, and is usually less expensive than hiring out. Finally, if you want to offset the cost of an expensive tool, such as a plasma table, you might consider hiring yourself or the use of your tool out to others to provide an income source. This is more my organizational style. You should always consider what the job is before buying a new tool. Often, a small simple job can be hired out inexpensively, saving you the cost of purchasing a specialty tool that you won’t use often. For example, building late model transmissions can require some very expensive and specialized tools; so, if you don’t see a lot of transmission building in your future, it may be less expensive (and quicker) to have someone else do it for you. On the other hand, if your mission is to learn a new skill, and you enjoy the process of doing it yourself, you can often buy the tools for the cost of someone else’s labor. This is the reasoning I used a few years ago when I installed a lift kit on my truck. I wanted the experience of doing the installation myself; I am a serious hobbyist and I enjoy teaching myself new things. I bought the tools I needed to remove the torsion bars and hubs, and spent a fun weekend doing the install. When it was done, I had gained some new knowledge, the job was done to my standards and satisfaction, I found myself $100.00 ahead on the project and I owned the tools, which I have used at least twice since. I’d call that a win! In the end you have to decide for yourself what you need from a tool and what your budget is. You should have some money worked into your build budget to cover tools that you will need, but you can never plan for them all, so be smart about it and keep your end goal in mind.